As much as the dot com era conditioned US individual investors to focus on stock market movements, credit markets are where the real action lies. Deterioration in the bond markets almost without exception precedes stock market declines (although debt instruments can also send out false positives). In the stone ages of my youth, the rule of thumb was a four-month lag. In 2007, that guide was not at all bad. The bond market turn began in June 2007 (yours truly took note of it then, see here for the critical development, but was not convinced it was the Big One until corroborating data came in in July). The stock market obligingly peaked in October 2007. Now given the extraordinary degree of government interventions, turns are not as obvious, market upheavals have repeatedly been beaten back, and relationships between stock and bond market price movements are likely to be less reliable than in the past. 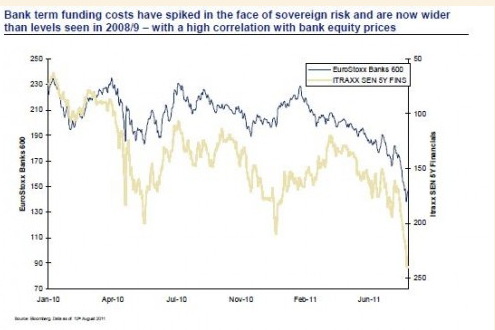 But one thing that is a clear danger signal is liquidity leaving the banking system. It’s like the preternatural calm when the water leaves the beach, revealing much more shore than usual, before the tsunami rolls in. Bankers who once ran the now-defunct repo facilities for medium-sized European banks say the credit lines were withdrawn after risk managers became concerned about their own exposure to the unfolding sovereign debt crisis, leaving some clients now solely reliant on central banks for cash…. The closure of traditional credit lines is a clear sign that concern about European sovereign debt has infected the region’s banks. Many in the region are big holders of the debt of their respective governments. According to the EBA stress tests published in July, the 90 banks it surveyed held a total of €326bn in Italian government debt, €287bn of Spanish public debt, and €215bn of French debt. For many, the European Central Bank is now the last remaining source of liquidity. Under its open market operations – brought in during the depths of the crisis to pump liquidity into the region’s banks – its member central banks provide unlimited repo financing against certain eligible assets. Demand for that money has been picking up of late, as banks feel the squeeze of dry private credit lines. Earlier this week, the Italian central bank said lenders asked for €80.5bn of liquidity during July, almost double what it had provided only a month earlier, in a sign of banks’ deteriorating finances. Total use of the ECB’s main refinancing and long-term refinancing facilities – both part of the open market operations – are now close to €500bn, up from about €400bn in the spring. Not that there’s a European banking crisis just yet. We can see how close we are coming, though. As US money market funds cut back on their European exposures, even the best European banks have to fill the gap by borrowing euros short term from the ECB, and swapping those into dollars. Last week the cost of that process for large banks reached between 80 and 85 basis points. Measuring that against the 100 basis point penalty rate for the Federal Reserve dollar swap facility with the ECB, the system was about 15 or 20 one hundredths of 1 per cent away from a crisis. Dizard also points out that the Eurozone isn’t prepared to enter into broad scale bank recapitalization programs; they’ll have to take place on a country by country basis. Yet he argues that the concerns are still overdone, for the Fed would ride to the rescue with swap facilities in a crisis, so US money market funds can keep their funding of Eurobanks (via repos) in place. Yet it does not appear that money market funds are all that sanguine. They’ve been pulling back from European banks for a while; the dry up of funding to medium-sized banks described in the IFR article is in part due to their newfound caution. And one can’t forget how public hostility can impede action. The reason the authorities didn’t bail out Lehman was that it was politically unacceptable to do so. And I’m not saying a rescue was the right answer, but relying solely on a private sector solution and not considering a resolution or a good bank/bad bank structure was remarkably short-sighted. Here again, a failure to appreciate the downside may again lead to sluggish responses and tactical rigidity that could prove deadly in a crunch. This post originally appeared on Naked Capitalism and is reproduced here with permission.